I never attended a Poetry reading in my whole life until on last Friday at the Majestic Roof. I never thought I could even be interested by such a concept, though I always loved Poetry, actually Charles Baudelaire was my favorite poet when I was 15 along with Rimbaud and Verlaine. 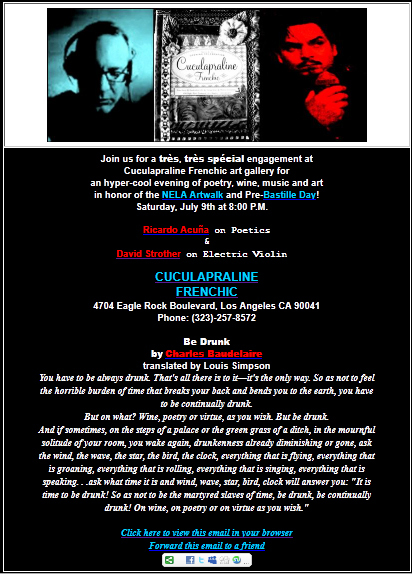 One day, on Internet, I saw Ricardo Acuna reading Poetry, with my friend David Strother playing violin just behind, as an illustration of the ideas flowing around, and I thought it was the most amazing thing I ever saw. We probably have such performances in France, I don’t know where, when, how, if people there only had the idea one day to step forward and do so? All I can tell you, the Poetry Reading Experience with Ricardo Acuna and David Strother is amazing and that’s why I absolutely wanted to share it with you. It will start at 8:00 pm on July 9th , 2011, in front of Cuculapraline-Frenchic, 4704 Eagle Rock Blvd, L.A., CA 90041 and as Baudelaire and us, come to be drunk of wine, poetry or virtue, let yourself be inspired by Poetry, as I was by Baudelaire on this painting “Les Dessous Congolais” I made years ago. Cuculapraline-Frenchic is all about discovery, magic and surprises!